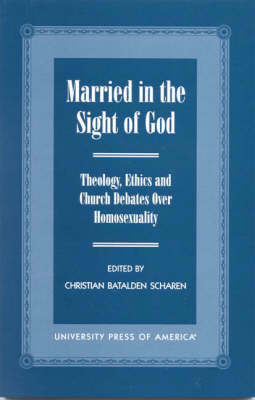 Married in the Sight of God is a case study into the contemporary sexual ethics debates in the Evangelical Lutheran Church in America. Christian B. Scharen analyzes the origin, rhetorical use, and institutionalization of the Lutheran "orders of creation" theology used to exclude gays and lesbians. In addition, this study shows that the Lutheran tradition holds neglected possibilities for an affirming theological and ethical position that blesses the lives and leadership of people - homosexual or heterosexual - who make life-long promises of love and fidelity one to another.